Today is the first day of the New Year and the year is starting with the blessed day of Friday. It is tradition to wish each other a Happy New Year, as such people are sending messages of good wishes to Hazrat Khalifatul Masih and they would be wishing each other as well. The New Year is celebrated in the Western, developed world by partying and drinking through the night and by firework displays. In fact this is also how it is now celebrated in Muslim countries. Television news was reporting last night with images of a 63-storey building on fire in Dubai alongside firework displays and it was repeatedly announced that notwithstanding the building on fire, the firework display would go ahead. Most Muslim countries are in a bad way these days but it is the way the wealthy show their materialism. Even if there had been no fire, it was the need of the time for wealthy Muslim countries to state that rather than spend on wasteful matters they would help the affected Muslims. But such is the state of affairs that a few days ago it was in the news that the most exclusive hotel in Dubai had the most expensive Christmas tree in the world at a cost of $11 million. These are now the preferences of wealthy Muslims. Conversely, there are many Ahmadis who spent last night in worship of God or woke up early to offer optional Prayers to start the New Year. Tahajjud Prayers in congregation were offered in many places. Yet we are deemed as non-Muslims while those who create a rumpus are Muslims. In any case, with the grace of God, we are Muslims and we do not need anyone’s testimonial for this. If we are desirous of any testimonial it is to be true Muslims in God’s sight. And this does not come to pass by offering individual or communal optional Prayers on the first day of the year or by alms-giving or doing some other virtuous act. No doubt pious practices attract God’s grace but there needs to be consistency and resolve in them. God desires constancy in piety. Along with offering Tahajjud Prayers what is needed to please God is to bring about a revolutionary pious change of hearts. This cannot be achieved by being pious for the odd few days. We should reflect as to what sort of practices do we need to adopt that will gain us God’s pleasure. To this end, Hazrat Khalifatul Masih related some advisory extracts of the one commissioned by God in this age, the Promised Messiah (on whom be peace). The extracts elucidate how to try persistently and with conviction to attain God’s pleasure, how to make 12 months of year and 365 days blessed to garner Divine grace. ‘Look at the state of the world! Our Holy Prophet (peace and blessings of Allah be on him) showed through his practice and his life and death and everything was for the sake of Allah the Exalted. As for the Muslims in the world today, if one of them is asked if he is a Muslim, he will respond by uttering, Alhamdolillah. The life principles of the one he professes to follow were for the sake of God, but the Muslim of today lives and dies for the world until such times that he is in the throes of death. The world remains his object of desire. How can he then say that he follows the Holy Prophet (peace and blessings of Allah be on him)? This matter is most thought-provoking, do not consider it something trivial. It is not easy to be a Muslim. Do not be content until you instil obedience of the Holy Prophet (peace and blessings of Allah be on him) and the Islamic model in you. If you are known as a Muslim without practising obedience then your [faith] is a mere shell and the wise do not suffice on mere shell and epithets. A Muslim asked a Jew to become a Muslim. The Jew replied, do not suffice on mere name. I called my son Khalid (long-living) but buried him before evening fell. Thus, seek the reality and do not be happy on mere epithets. How disgraceful it is that one is known to be from the Ummah of the magnificent Prophet (peace and blessings of Allah be on him) but spends life like disbelievers. Demonstrate the model of the Holy Prophet (peace and blessings of Allah be on him) in your life and generate the same condition. Be mindful that if you do not have the same condition, you are a follower of Satan. ‘Do not live your life without fear of God. Engage in prayer and istaghfar (seeking forgiveness from Allah) and generate pious change. It is not time to remain negligent. Man is fooled in thinking he will have a long life. Consider death as close by. The Being of God is a Certainty and whoever gives the rights due to God to others through wickedness will experience a disgraceful death. Surah Fatihah mentions three groups of peopleâ€¦In [early] Islam if one person apostatised, the reaction would be catastrophic. Now 200,000 have become Christians and having become impure they abuse the pure being [of the Holy Prophet]. An example of those who incur God’s displeasure is being shown via the plague. This will be followed by the group of those on whom God bestows His blessings. ‘The righteous are given a manifestation of God and they are under the protection of God. But what is needed is that one is sincerely righteous with no measure of satanic influence. God does not like shirk (associating partners with God) and if one has some measure of satanic influence God Almighty deems it all to be from Satan. Pain experienced by beloveds of God comes to pass by Divine will. Otherwise the whole world put together cannot give them the slightest of pain. Because these people are role models for the world therefore it is imperative that they also demonstrate models of how to endure difficulties. Otherwise Allah the Exalted states that He is not concerned about anything as much as He is by taking the life of one who is His friend. God Almighty does not want His friend to experience any pain. But they are given pain because of need and expediency. Therein lies their own good because their high morals during pain become apparent. Prophets and friends of God do not experience pain in the manner, for example the Jews are being disgraced with a display of Divine displeasure and chastisement. Rather, Prophets of God demonstrate models of courage. God Almighty had no enmity with Islam yet the Holy Prophet (peace and blessings of Allah be on him) was left alone during the Battle of Uhad. The idea behind this was to reveal the courage of the Holy Prophet (peace and blessings of Allah be on him). He stood alone in the face of 10,000 in that he was the Prophet of God. No other Prophet had the chance to demonstrate such a model. We say to our Jama’at not to feel proud for merely offering Salat, keeping fasts or avoiding main sins like adultery, theft etc. Most people from outside the Jama’at, the idolaters etc. are like you in these qualities. ‘All the faculties granted by Allah the Exalted are not to be wasted, they are developed through right and proper useâ€¦It is stated: ‘Surely, success does come to the believers.’ (23:2) And after illustrating the life of the righteous it is stated in conclusion: ‘â€¦And it is they who shall prosper.’ (3:105) That is, those who practice righteousness, believe in the unseen. They lose concentration in Salat, but then they recover and they spend out of which God has bestowed them. In spite of possible personal hazards they impulsively believe in the past and current Books of God and ultimately they reach the stage of certain belief. These are the people who are on the way of guidance. They on a road which stretches right ahead and which takes man to the station of ÙÙ„Ø§Ø­ success/prosperity. These are the successful people who will reach their destination and they have been delivered from the perils of the journey. This is why Allah the Exalted gave us the teaching of righteousness at the outset and granted us a Book which carries commandments regarding righteousness. ‘I have spoken many times before on mutual love and accord in the Jama’at. Have mutual accord and stay united. Allah the Exalted gave the teaching to Muslims to stay as one otherwise they would be diminished. The commandment to stand shoulder to shoulder during Salat is to promote mutual unity and so that goodwill can permeate like electric current from one to another. If you have discord and lack unity you will be unsuccessful. 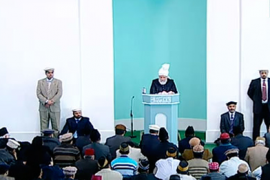 The Holy Prophet (peace and blessings of Allah be on him) said love each other and pray for each other in secret. If a person prays for another in secret angels wish the same for him. How superb is that. If man’s prayer is not accepted an angel’s certainly is. I advise you and wish to say to you not to have discord with each other. ‘Allah the Exalted states in the Holy Qur’an: ‘â€¦and will place those who follow thee above those who disbelieve, until the Day of Resurrectionâ€¦’ (3:56). This reassuring promise was made to son of Mary born in Nazareth. But I give you glad-tidings that Allah the Exalted has also giving the glad-tiding in these words addressing the son of Mary who was to come with the name of â€¦ Messiah. Imagine now that could those who wish to be included in this grand tiding by connecting with me, be those who are at the stage of ‘incitement of evil’ and are acting upon wicked ways? Most certainly not. Those who truly value this true promise of Allah the Exalted and do not consider my words as fables, remember and listen with sincerity, I once again address those who are associated with me and this is not by way of an ordinary bond, rather it is a great bond. The impact of this bond is not limited to me but reaches that Being Who took me to the eminent, perfect man who brought the spirit of truth and honesty to the world. Had this matter only impacted me, I would have had no care or concern. But this is not how it is. Its impact reaches the Holy Prophet (peace and blessings of Allah be on him) and God Almighty Himself! Thus, in such a situation, listen most attentively if you wish to partake of this glad-tiding and wish to be its corroboration and you have true thirst for such a great success (in that you will triumph over disbelievers till the Day of Judgement) I say only this much that this success will not be realised until you traverse the state of reproving to the state of peace. ‘Do not think that God is pleased merely by taking bai’at. This is mere flesh while the core lies within. According to most laws of nature there is a shell containing a kernel. The shell is of no use and it is the kernel that is usedâ€¦Similarly a person who claims to have taken bai’at and have faith but does not have the essence of both these aspects within him, should be fearful. A time comes when the slightest of knocks reduces him to smithereens â€¦ and he is discarded. Similarly, one who lays claim to bai’at and faith should grapple and see whether he is a mere shell or does he have a core. Unless there is a core, faith love, obedience, bai’at, reliance and following, a follower of Islam is not a true follower. Remember, it is the truth that Allah the Exalted has no value for a shell without a core. Remember well that death can strike any time but it is a certainty that death will strike. Therefore, do not suffice on mere claims and be happy. It is most certainly not a beneficial matter unless man adopts many death-like states and does not traverse through many changes and transformations, he cannot find the real objective of humanity.’ (Malfoozat, Vol.II, p. 167). May we form our lives according to the wishes of the Promised Messiah (on whom be peace) and move onwards towards piety. May we not let the prayers of the Promised Messiah (on whom be peace) go to waste, rather may we ever be the recipients of the prayers that he made for his Jama’at. Huzoor wished a Happy New Year and prayed that may God make the New year a source of numerous personal and communal blessings.